We headed down to the Jamaican army camp to ask for more food. They gave us water, mackerel, ALWAYS pads, canned breadfruit, corned beef and flavored snow cone syrup. We got 2 trucks full! God is SO amazing and provides just when you need it the most! We spent most of the morning loading, unloading and sorting food. The afternoon was playing. We handed out some car toys, jump ropes, hair accessories and a soccer ball. 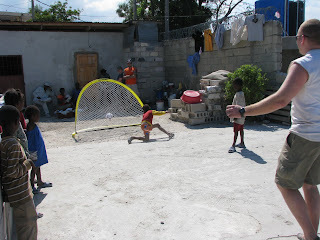 Rick played soccer with the boys for a little while and they loved it! 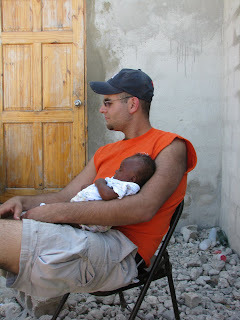 Roro had to go back to Jacmel to pick up Ginny so Sarah and Joe rode along with him. Dad, Michael, Rick and I were able to eat dinner at EPIDOR’s . It is a ‘American food’. They serve hamburgers, French fries, pizza, French crepes, fresh bread, pastries and ice cream!!!! 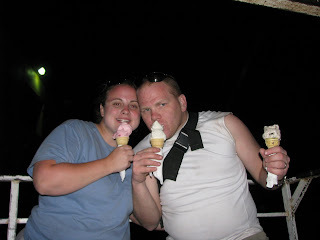 My first taste of the cold creaminess of ice cream in 3 weeks!